President Donald Trump’s latest pick to serve on the Federal Reserve Board said he’d be an independent voice in that role and that he doesn’t always agree with the president, particularly on trade and immigration. 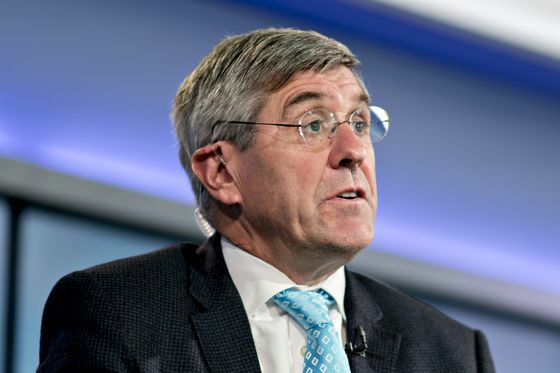 “I think 75 percent of the time I agree with Donald Trump, I give him really high marks for his handling of the economy,” Stephen Moore said in a CNN interview on Saturday. “There are many times I disagree with him. I’m pro-trade, I’m more pro free-trade than he is, I’m probably a little bit more pro-immigration than he is, so I will be an independent mind for growth and the American worker,” he said. Long known a champion of free trade in the Republican mold, Moore pushed back this month against the president’s repeated threat to slap new steep tariffs of up to 25 percent on automobiles, which automakers, parts suppliers and dealers staunchly oppose. The economic commentator and senior fellow at the conservative Heritage Foundation also praised Trump’s handling of the economy and echoed the president’s ongoing criticisms of Fed Chairman Jerome Powell. He called the central bank’s late-2018 rate hikes “questionable,” after terming the December increase “a very substantial mistake” in a March 22 interview on Bloomberg Television. “My objective when I get over to the Fed is to help Chairman Powell pursue the policies that will grow this economy, provide high wages, a lot of jobs and stable prices, and I don’t think that’s too controversial,” Moore said on CNN. Keeping prices stable would help maximize economic growth, he said. Trump said on March 22 he’d tap Moore for the open Fed board seat. The White House hasn’t yet officially submitted Moore’s nomination to the Senate, which must vote to confirm him. Responding to criticism that he lacks what Harvard economics professor Greg Mankiw called the “intellectual gravitas” to serve at the central bank, Moore said on CNN that being a PhD economist wasn’t a prerequisite. Three of the five current Fed board members, notably Powell, have law degrees. Earlier on Saturday the Guardian reported that Moore had been found in contempt of court after he failed to pay his ex-wife some $300,000 in alimony after their 2010 divorce, citing court records. A judge in Virginia reprimanded Moore in 2012 after he didn’t make spousal support, child support and other payments required by the divorce settlement, and in 2013 ordered Moore to sell his house to satisfy the debt, the Guardian reported. Moore’s ex-wife halted the sale process after he partially paid what he owed her, the paper said, citing court filings. Reports earlier this week showed that Moore owes more than $75,000 in taxes and other penalties to the U.S. government. A federal tax lien filed in the circuit court for Montgomery County, Maryland, where Moore owns a house, says that the government won a judgment against Moore for $75,328.80. The January 2018 filing said the lien was for unpaid taxes from the 2014 tax year and could accrue additional penalties and other costs.